In this iWorld earbuds review, we focus on the iWorld Matrix Neons Earbuds line of noise isolating, in-ear headphones. Key features include the following. Bright pink and lime green in color. Cost less than ten dollars. Often however, they appear for less than five dollars at many discount and dollar stores. As is typical for iWorld, they’ve again built a cheap, brightly colored, reasonably well performing cell phone headset. These also work well on CD and MP3 players. They provide acceptable performance. Plus, their near-bargain-basement prices make them easy to throw away when they wear out. But they are by no means junk. Those joggers and gymnasts who trash earbuds, breaking them with high frequency, will appreciate these buds. True. These do not measure up to higher-end portable headphones from Koss, Pioneer, Sennheiser, and the like. Yet these iWorld Neons appear reasonably rugged. They play quite loudly, fit well in the ear, and stay put once you insert them. These iWorld earbuds with microphone are near to the best communications grade headsets. But they may have the worst sounding drivers we’ve ever played our music through. Yet as low-end ear buds go, these have some sound advantages. Due to reduced high frequency output, these buds virtually eliminate the hiss of old cassette tapes. They also cut the crackle of old vinyl records. Plus, the reduced bass frequency output stops the rumble and hum of cheap grade turntables and amplifiers. The quality here is enough for these situations. Yet the near-minimum price is low. Low enough that you can break them with abandon. Soak them in the rain. Just sweat bricks all over them. At these prices, you can always buy more. So earphones like these make a great first-pair for the beginning listener. Less than $10. Bought this set for $5 at Gabriel Brothers. Pretty cheap price for as good as they sound. The packaging is perhaps even more durable than the product inside. Difficult to open, but solid. These will likely never be damaged in shipment. 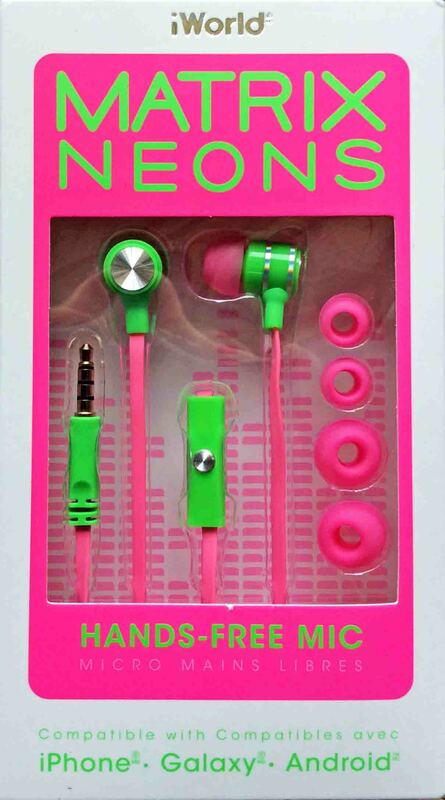 These iWorld earbuds are bright pink and lime green fluorescent colors. Generally stay tight in the ear. The reduced depth of the tiny speakers completely fit inside the outer ear and do not protrude. This makes them harder to accidentally yank out. They do indeed fit our small ears quite well. The microphone and buds are made of a hard, sound-neutral plastic, for enhanced durability and audio performance. Strain relief at the plug as well as at each bud. Many earbud sets only offer this at the plug, like the ear pieces do not need it. They do need it however, and iWorld recognizes that in the design of this product. Supports hands-free voice pickup via the inline microphone. The mic also includes a play/pause answer/hang up button. Great for cell phone operation. The audio frequency response seems to suit this style of communication best; intelligibility is maximized. Conversations sound crisp and easy to understand, as these are designed to work best with mainly speech frequencies. Can produce plenty of midrange volume. Instruction manual and three sizes of ear inserts provided. Standard equipment with most earbuds these days. You can replace the ear cushions too. How so? These drivers are a common size. So the inserts from other iWorld earbud sets fit this set too. Harder to hear imperfections in recorded music with these earbuds; due to their limited frequency response. Now they put in a remote control button on the mic. So it seems that iWorld could have added two more buttons for volume. Indeed most other earbud / microphone combination units include this. So why not iWorld? True. No noise cancelling. But definitely noise isolating. What? You didn’t expect active noise cancellation at this price, did you? More delicate (thinner cables) than the iWorld Sonic Earbuds reviewed previously. 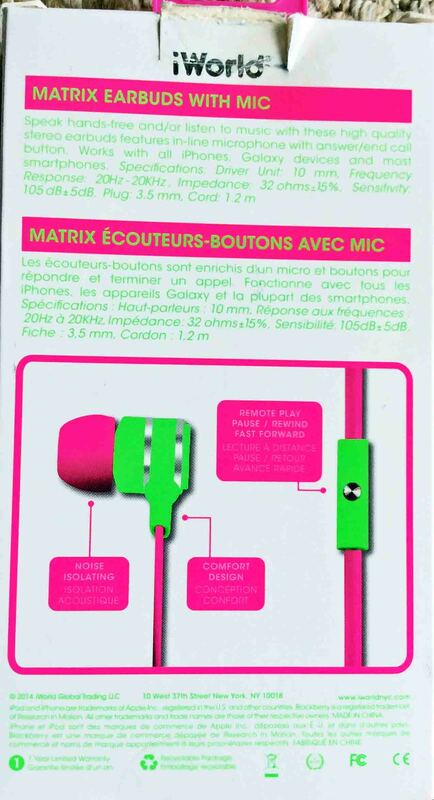 And like the Sonics, these Matrix earbuds have terrible fidelity for music. Definitely not hi-fi. They perform best in the midrange frequency range. Both bass and treble seem low. Plus, so much mid range can sound harsh and tinny at higher volumes. No flexible strain relief provided for the cables at the entrances to the mic unit, or the earbuds themselves. Without at least a little pouch, these earbuds can quickly become tangled and knotted. Ear bud driver size: 10 mm. Impedance: 32 ohms, within a 15% tolerance. We advise against this pair of iWorld earbuds for more than the most casual music listening. But for a sale price of $5, we expected no more than this tier of performance. Over all, we’d rate them at 91 out of 100. Save the inserts if you hate the earbuds themselves. Indeed, these tips appear to be about the best parts on this headset. Look for them in the white box with fluorescent green lettering on a bright pink background. Find them at many bargain stores and flea markets. Though iWorld headphones are often hard to find, we found ours at the Gabriel Brothers discount store. 2019-03-19: Added subheadings, tags, and key phrase targeting. 2014-12-09: Updated content, added whitespace, and adjusted ad placement.